Looking for quickdraws? Check out our Buyers Guide! Quickdraws are an essential piece of climbing and mountaineering equipment and should be included in any alpinist's basic gear. Quickdraws are sometimes known as extenders. They consist of two non-locking carabiners connected by a dogbone. 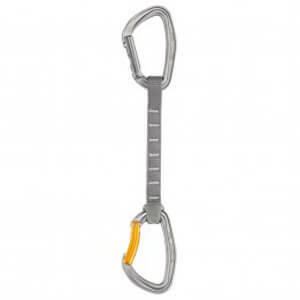 They extend the carabiners at intermediate anchors in order to reduce rope friction. Quickdraws act as an important link at anchor points and prevent the carabiner from twisting and causing dangerous transverse loads. Although the wide range of quickdraws may appear confusing at first, with a bit of experience you are sure to find the right product. Quickdraws with a 12 cm dogbone have become standard for sport climbing. This length fulfills all of the important requirements without getting in the way on the belt too much. Longer dogbones are used for multi-pitch alpine routes and very long sport climbing routes, where reducing rope friction is of increased importance. The longest dogbones found on quickdraws are about 30 cm. Generally speaking, any common non-locking carabiner can be used for a quickdraw. Classic variations have an all-aluminum non-locking carabiner at both the protection-end (the end that connects to the bolt) and the rope-end (the end that connects to the rope). Key lock carabiners have been used almost exclusively for the last few years. The advantage being that the nose of the carabiner cannot get hooked up on the bolt. This significantly improves quickdraw handling. You can also find quickdraws equipped with wire gate carabiners. The advantage of this design is that the closure does not freeze together in icy temperatures. They are also safer in so much as they are less susceptible to gate whiplash if the carabiner hits the rock, meaning they are less likely to undergo an "open gate" loading scenario. 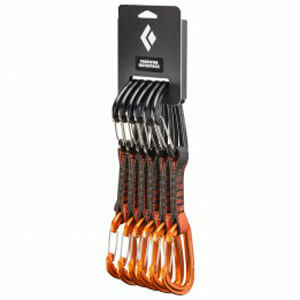 Some quickdraws feature wire gate carabiners with a keylock-like system, which combine the advantages of both forms carabiner. Other quickdraws use a combination of different carabiners. Whatever your personal preference it is easy to find the right quickdraw for you. Another question which inevitably comes up when buying quickdraws is that of the dogbone material. Dyneema has the advantage of being much lighter and is used for quickdraws where keeping the weight to a minimum is the priority. Nylon is heavier, but less sensitive to UV radiation. Nylon slings are also slightly wider and as a result often preferred by beginners and when checking out routes - they are much easier to grab hold of than thinner Dyneema quickdraws. Another practical detail to look out for is rubber keepers on the quickdraw. They prevent the rope-side carabiner from twisting into the dogbone. This further improves safety and makes clipping the climbing rope in the quickdraws even easier. As well as the oversized quickdraws mentioned above there are some other special designs. For example, quickdraws which feature locking carabiners at both ends. This design is ideal for particularly important intermediate belay points, since the danger of an open load is greatly reduced. You also get quickdraws with a stiffer dogbone which can be used as a makeshift clip stick.